1The growing urbanization worldwide increases the stress on the natural water cycle. Over the centuries, human society have influenced and adapted the natural water cycle to answer its needs. In densely urbanized settings, this adaptation is supported by large infrastructures that supply drinking water and complex sewer systems for the rapid evacuation of domestic water. More and more impervious surface are produced to keep the feet dry with consequently less water to be infiltrated and more run-off water produced carried over by the sewers. In this context, cities are particularly vulnerable to flooding, especially as surface imperviousness increases, inducing more run-off water, and often saturation of the sewer system. The Brussels Capital Region (BCR) is particularly prone to inundation and sewer overflow because of its topography, rapid urban growth and ageing sewer system [RBC, 2008]. Moreover, it is characterized by a combined sewer network that carries both wastewater and rainwaters, amplifying the environmental impact of flood and overflows. Most commonly, urban water management, and flooding in particular is considered according to an end-of-pipe approach [Coffman, 2002] implying major engineering solutions and little consideration of the natural environment. In the beginning of the ’90, the Integrated Water Management (IWM) concept emerged which is “based on the perception of water as an integral part of the ecosystem, a natural resource and social and economic good, whose quantity and quality determine the nature of its utilization” [Meire et al., 2007]. This more sustainable approach emphasizes the importance of considering all the natural and human components of a landscape that influence the city water cycle, and this from the beginning of the urban planning process. IWM aims at tackling the causes of the water cycle dysfunctions more than the dysfunctions themselves, as in the end-of-pipe approach. It is based on a broad understanding of the influence of urban planning decisions on the water cycle and offers a set of possible solutions to deal with water related problems, such as floods, pollution and environmental degradation [Meire et al., 2007]. 3This study examines the currently available cartographic data of the BCR and its surrounding area that can be used for the description of landscapes towards an IWM. Furthermore, to provide examples of the use of cartographic data for IWM analysis in the Brussels case, two landscape analyses are presented. Building on the examples, potential and deficiencies of the available cartographic data are discussed. 4The influence of rainfall events, land uses or urban features on the hydrological response can be measured on multiple scales going from the area of a house (m²) to a whole watershed (km²). Conducting analyses at these multiple scales is essential for IWM [Meire et al., 2007]. However, watershed borders are generally independent from political and administrative subdivisions, and the latter often determine the availability of cartographic data (figure 1). 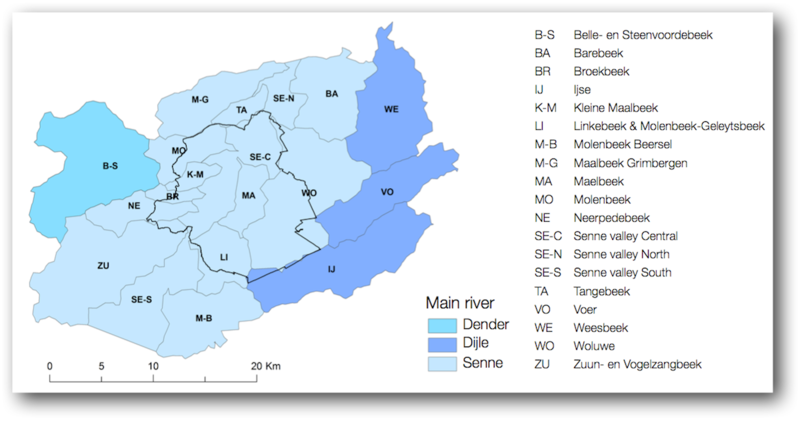 As a typical example for the Brussels area, the Molenbeek watershed (figure 2) is located between the Brussels and the Flemish region. To carry out an analysis at the watershed scale, datasets coming from different institutions need to be integrated, compared and correlated. Methods and units of measurement, dimension and even resolution often differ between institutions. 5When analyzing landscapes on a relatively large scale within or in the vicinity of Brussels, the institutional organization of Belgium leads to a complex situation where data must be gathered from at least two different institutions, a Flemish and a Brussels one. At even larger scales, a Walloon database should also be added. Some cartographic data can also be accessed by contacting specific administrations and following procedures that can be time demanding or costly. In addition, multiple associations often operate on the same territories without an existing coordinating organization. Consequently, the assemblage of cartographic data becomes one of the major difficulties of working on the watersheds within and around the BCR. The following section is an attempt to account for the different platforms where free cartographic databases are directly available and to discuss the characteristics of the data. The main focus of free and available data aims to describe the situation of a general user (e.g. landscape planner, urbanist, project developer) having limited time and resources for data collection. 6The BCR has developed since November 2010 a geoportal under the name geo.brussels [CIRB-CIBG, 2014a], which aims at assembling all the official geographical data on the BCR. It was developed following the European Directive “INSPIRE” (“Infrastructure for Spatial Information in the European community”), an effort to support European environmental policies by demanding the public sector to distribute and share its geographical data. This geoportal was developed by the Brussels Regional Informatics Centre (BRIC). 7The geo.brussels platform constitutes a starting point of the different public institutions offering cartographic data of the BCR. The catalogue displays the necessary information about the available data with the metadata files, the public institutions where it can be found but without a direct link – and that is a significant pitfall – to download the data. However, the geo.brussels platform provides a range of cartographic webservices with links according to each public institution giving access to WMS (Web Map Service) for the data display and WFS (Web Feature Service) for the access to the data. It is important to note that some public institutions through this platform only offer WMS webservices, which permits data visualization only. It is thus impossible to directly carry out any necessary data management and/or calculation. Depending on the public institutions, some of the cartographic data of the BCR can be found and downloaded through their specific websites. 8As well as the BCR, the Flemish Region created the AGIV (Agency for Geographical Information for Flanders) following the European Directive “INSPIRE” to assemble and manage all the geographical information coming from its public institutions [AGIV, 2014a]. 9The AGIV displays the cartographic data through a catalogue accessible on its website [AGIV, 2014a] and through a gateway called Geopunt [AGIV, 2014b]. The AGIV catalogue has a list of the different existing data with metadata files, necessary information of the public institution owning it and in some cases, a very practical direct link to download the data. Alike the geo.brussels platform, the Geopunt gateway offers the same information and links. In case the data is not directly downloadable from the AGIV catalogue or the Geopunt gateway, a demand can be sent to the institution using the Giraf application on the internet. 10Supplementary maps and data are accessible to GIS-software users through other platforms. Whether these maps cover the area of only one region or several regions vary according to the level of the providing authority or institute, the attributes of the data or the specific intentions of the platform creators. In the context of landscape analysis for IWM, the DOV Vlaanderen (underground database of Flanders) [DOV, 2014] is a useful geological database with cartographic data covering both the Flemish Region and the BCR that can be used for the analyses of underground water processes. The European Environment Agency (EEA) also offers an extensive range of environmental information, statistical data and maps but generally, it covers the whole area of the member states of the European Union (EU) [EEA, 2014]. Its use requires thus supplementary resources and time in order to manage and reduce the large amount of data. Furthermore, the EEA data are often gathered from local institutions of the EU-member states and adapted at the EU-scale. This procedure requires time and it is possible that the data is not up to date. 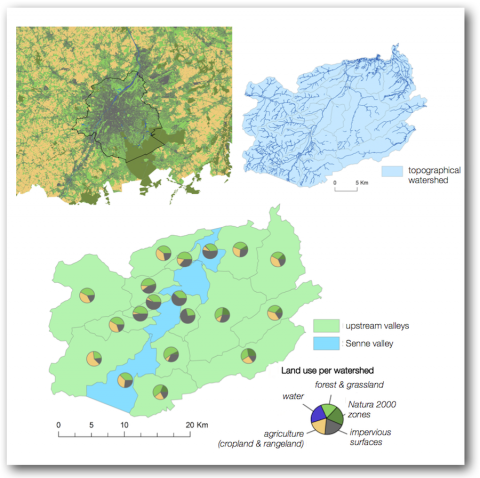 In addition, due to the large area requirements, the cartographic data can have a low resolution limiting its suitability for the landscape analysis of small catchments. If one is interested only in local analyses and not in international comparison, it is thus generally more appropriate to get the information from the local institutions, which have more recent and spatially precise data for the area of interests. 11Other platforms offer free cartographic datasets but their number is too extensive to make a useful and structured enumeration of it. Depending on the analyses that need to be performed, one or another of these platforms could be helpful. Those presented in the previous sections, because of their institutional framework and reliability, are yet the most suitable to make good quality analyses for IWM. Other cartographic databases are also created by different research institutes and universities and can be extremely useful for specific applications. However, they are seldom indexed on a single website and generally not directly available. Depending on the institute and university, these databases can be collected through a demand procedure addressed at the producer. 12The IWM regards water as an integral part of the ecosystem and takes into account all the landscape features that influence the urban water cycle [Meire et al., 2007]. To analyze the influence of landscape features on the urban water cycle, a good starting point is to analyze the land use patterns of each watershed located within and around the BCR. This leads to a global view of the types of landscapes present and to an assessment of the land use influence on the urban water cycle for each of them. This analysis requires gathering the cartographic land use data from the different regions, aggregating them in a homogeneous way and finally distributing them according to a hydrologic division in watersheds. The first two operations result in a land use map produced through the use of vegetation data of the Agentschap voor Natuur en Bos (ANB, “Forest and grassland” and “Impervious surface” covering only the Flemish Region) [AGIV, 2014a] and agricultural data of the Agentschap voor Landbouw en Visserij (“Agriculture” covering the BCR and Flemish regions) [AGIV, 2014a] in combination with the Natura 2000 map of the EEA (“Natura 2000 zones” for both regions) [EEA, 2014]. For Brussels, an impervious surface map by the IGEAT department of the Université Libre de Bruxelles (only for the BCR and close neighborhoods, not available online) was used to determine “Impervious surface”. “Forest and grassland” for Brussels were the remaining uncategorized areas. An “Ecology Network” map of the IBGE-BIM using a methodology and categorization similar to the ANB map exists but in its WFS version the data presented some problems during the analysis. Thus, the data could not be directly processed and the ULB map was used instead. The definition of the borders of the topographical watersheds was elaborated using a digital elevation map [DOV, 2014] through a hydrological toolbox of ArcGIS requiring choosing outlet points (figure 1). Using these two maps (land use and watersheds), the rate of the land uses per topographical watershed was generated (figure 2). 13As it could be expected, the Southeast of the metropolitan area is characterized by a high presence of Natura 2000 zones around the Sonian Forest. The land use “Forest and Grassland” implies not only unprotected forests but also parks and (large) private gardens. In combination with the Natura 2000 zones, it depicts a gradient of relatively high quality green spaces increasing from the Northwest to the Southeast, while it outlines a low rate of these green spaces in zones with a high agricultural rate as well as in the Maelbeek watershed. The urbanized and industrial land use, portrayed by “Impervious Surface”, does not follow a preferential direction but depicts more an axial diffusion centered on the Senne and the Canal. The rate of impervious surface of the watersheds remains very homogeneous outside of the BCR ranging from 15 to 30%. “Agriculture” class takes into account essentially cropland and rangeland. Its distribution seems strongly dependent on the other land uses suggesting that “the agriculture” can be seen as a “residual land use”, limited or progressively consumed by the other land uses. It has a very low rate around the Sonian Forest, the historical presence of the protected forest prevented the conversion to agricultural soils [Roland, 2012], and is almost nonexistent in the center of the agglomeration (“consumption” of agricultural soil by urbanization). An “agricultural” ring can be noticed around the BCR with a relatively high rate (30 to 40%) in the watersheds located partly in the BCR and partly in the Flemish Region. The Zuun watershed constitutes an exception, being the only watershed with a majority of agricultural land use (60%). The impact of agricultural practices in the Zuun valley on the water cycle is thus of higher importance in comparison with other watersheds. 14Except from the Senne valley, the proportion of impervious surface in the periphery of the BCR differs little. As though, it could be assumed that the natural environment, which on the contrary differs much in the periphery, has little influence on the rate of this concentric urbanization. However, the impact of urbanization on the urban water cycle can be highly variable according to landscape parameters such as the topography, the geology, the rate of other land uses or the particularities of the drainage system. In this matter, the IWM should be adapted to these local landscape parameters. 15The high potential for water resources is associated with “Forest and grassland” and “Natura 2000” zones. The runoff water at the origin of downstream flooding is significantly reduced through processes such as infiltration and vegetation in these pervious and vegetated areas. Additionally, these processes have generally a positive influence on the water quality. Yet, “forest and grassland” zones do not enjoy the same juridical status as “Natura 2000” zones and could more easily be subjected to land use change into impervious surface thus potentially reducing its beneficial influence towards the urban water cycle. “Agricultural” areas share the same position because in case of urbanization, they will likely be the first land use to be consumed. 16Watersheds with high rates of imperviousness generally have also a non-negligible rate of “forest and grassland” areas. The probable reason is that, when urbanization occurs, the change into “impervious surface” is usually associated with a portion of green space under the form of parks and private gardens. These green spaces represent a great potential in reducing total runoff in urban areas by preserving infiltration and evapotranspiration functions. Increasing and efficiently exploiting this potential during urbanization constitutes a key issue for sustainable urban planning. For the local application of these possible solutions, a more precise landscape analysis is required on a smaller scale. The Molenbeek watershed will be taken as an example here due to its particularities and to the previous studies existing. 17The Molenbeek watershed represents an interesting case study in regard of topographical and geologic features. The northwest of the BCR is constituted of alternating sand and clay layers [Laga et al., 2001; Buffel & Matthijs, 2009]. This geological configuration determines the preferential resurgence and groundwater recharge zones [Sorel et al., 2011]. Water infiltrates and percolates more easily through sandy layers than through the impermeable clay. Groundwater accumulates on top of clay layers creating aquifers, which finds their way through the sandy formations to the surface forming sources. It is important to note that these aquifers have a downward slope towards the North, which means that some of the rainwater infiltrating south of the watershed, even outside it, contributes to the resurgence in the Molenbeek watershed. Consequently, land use features located south of the watershed borders, influence the groundwater quality supplying the sources inside of the watershed. The zones through which the groundwater is recharged and those of source resurgences are depicted on the figure 3A. These zones present specific particularities in terms of their influence on the water quality and thus need to be taken into account in urban planning projects [Sorel et al., 2011]. 18Another particularity of the Molenbeek is its connection to the sewer system. In the past, the Molenbeek rivulet was systematically directed towards the sewer system at different locations of its path. Presently, thanks to a recent effort aiming to restore its natural course and supported by the Maillage Bleu of the IBGE-BIM, the Molenbeek passes through different green areas before being definitely covered and sent towards the sewer system at the Parc de la Jeunesse. [Sorel et al., 2011]. It is thus important to analyze the different land use features that are present on surface of these groundwater recharge zones as well as along the streams to make a state of the situation and an account of the water management possibilities. 19As discussed in the previous section, specific techniques and approaches of water management correspond to specific land uses. It is interesting to clearly distinguish the areas with a majority of pervious or impervious surface. The figure 3B was drafted by separating selectively the Molenbeek watershed and its surroundings in different zones according to the predominant land use. Zones with a majority of “agriculture” and “forest and grassland”, “Natura 2000” and “forest and grassland” (hence both pervious surfaces) and of “impervious surface” were selected. The figure shows that this zone is in the peri-urban area, is administratively fragmented. Large infrastructure and administrative borders cross the continuity of the water cycle and the river course and concurring planning actions are thus needed to reach IWM. 20LID solutions can be applied during urbanization or, in a lesser proportion, to already urbanized areas (“impervious surface”), as a way to reduce the pressure on the whole drainage system, maintain the water quality and control the runoff path on the impervious surfaces should stop or reduce the arrival of pollutants into the stream. Regardless of the land uses, the soil quality in the groundwater recharge zones and along the stream must be preserved to maintain water quality. This can be done by preserving and protecting the green areas -the Scheutbos, Kattebroek, Haverbos or Laarbeekbos for instance- from pollutants. On this matter, the presence of an industrial zone at the crossing of the A10 and Ring highways can be acknowledged as a problem. Enhancing the development of vegetation strips along the stream in these more urbanized areas would create a buffer between pollutant sources and the water body and increase the connection among the green areas, thus helping to preserve the water quality. 21Relative large agricultural areas are also present in groundwater recharge zones and along streams areas. Several soil and water conservation techniques on cropland and rangeland that improve water quality and enhance the biodiversity are available. Several studies have demonstrated their efficiency [Schnepf & Cox, 2006]. Such techniques can have a positive influence on the runoff flows and the water quality of the stream downslope. As an example, vegetation buffer zones around and between agricultural lands enhances biodiversity, reduces erosion and help in controlling air, soil and water quality. These buffer zones retains runoff water and consequently minimize the runoff rate and act as a filter in the displacement of polluting elements. 22The first problem is related to the lack of knowledge of the availability of the data. Many institutions possess large cartographic datasets but, while initiatives are made to gather all the available cartographic data at the level of each region, a clear list for each platform featuring the totality of the data and their characteristics is lacking. While the clear consequence of openly diffusing data is that they will be used in broader applications, the technical characteristics of the cartographic data owned by the various institutions, as well as the accompanying metadata, are defined by the specific functions and purposes of each institution and are not intended to support larger purposes. Additionally, procedures for the acquisition of some data owned by different institutions can be very long, which limits data exchange between these institutions and can be another cause for the lack of concordance in their technical characteristics. It becomes thus difficult to perform a holistic and interdisciplinary landscape analysis. 23A second problem is the accessibility of the data. The cartographic data can either be non-accessible, accessible only for display or fully usable. Because the data are spread over different platforms, which do not necessarily share the same units, dimensions (e.g. 2 classes on the IGEAT map and 4 classes on the ANB map), resolutions (e.g. 0.6m on the IGEAT map and 1m on the ANB map) or regions of coverage, data processing is required before starting a landscape analysis of a specific area. The extensive search for data, exploration of the practicable analyses and furthermore data processing are time demanding. On the contrary, some cartographic data such as part of the data from the DOV Vlaanderen platform (soil, geological and topographical data) or the data from the EEA (Natura 2000 data) do not require processing for data concordance because cover the area of both regions and their use is consequently time gaining. 24The variability of data and their distribution amongst different regions also leads to a situation where some landscape aspects are not featured in the same way. For instance, the treatment of railway zones is different between the map of the IGEAT department of the ULB (used for the BCR) and the vegetation map of the ANB (used for the Flemish Region). This difference is due to the different objectives that lead to the creation of these maps. The railway zones on the IGEAT dataset are identified as pervious and consequently drawn as “Forest and Grassland” on the map. On the ANB dataset the same railway zones are considered built areas, consequently processed as “Impervious Surface” on the map. Thus, it is important to note that the methodology differences between maps coverage by different regions leads to some lack of concordance in the integrated resulting map. Fortunately, in our application these differences are only observed for the railway zones, a negligible area compared to the whole watershed surface. Nevertheless, this discordance in methodology can represent a major issue and precautions need to be taken, starting from a careful analysis of metadata when using similar data from different sources. 25One of the main difficulties discussed in this paper is the lack of data concordances when working on relatively large scales including areas spread over different regions. The data handling necessary to obtain a homogeneous map covering over the two regions is problematic and time demanding. When they exist, cartographic data covering both regions bring much more ease. As water management -like many other planning applications- have multi-scale properties and require multi-scale and pragmatic landscape analyses, it appears necessary that the authorities in charge of geographical data production work toward interregional maps or at least, toward common standards to ensure the concordance of regional maps. From this perspective, the creation of a common geographical basis covering all the regions, the development of a platform sharing all the cartographic data with shared technical characteristics would make specific data at a determined scale much more accessible, arguably, the existence of common standards will even simplify data acquisition by the responsible institutions. Additionally, it would ensure more transparency on the availability and quality of the data. 26Supranational institutions like the EEA offers a wide range of land use, hydrological and topographical maps and data at the European scale. The land use maps have a relatively low resolution (250 meters) and cannot be used for fine analyses at the scale of the BCR and its surroundings. Nevertheless, the different maps provided by EEA offer the opportunity to perform analysis on very large scales and bring insight in possible water management attentions and solution at European watersheds” scale. 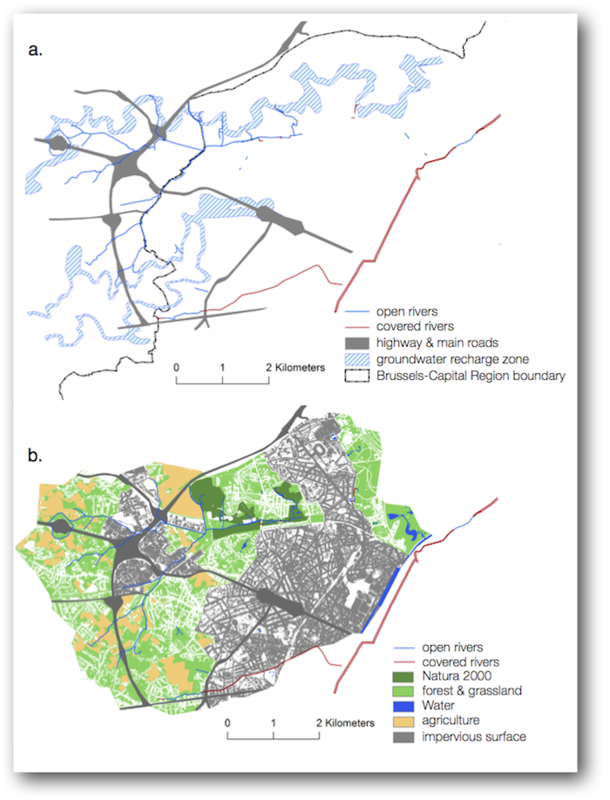 27The two landscape analyses exemplified here are carried on a large and medium scale relevant for urban planning. The project scale is generally smaller and should be based on a more precise and detailed understanding of the influence of the landscape features on the runoff flows. The two previous analyses have the asset of giving description and traits of different watersheds, offering an orientation to possible solutions or specific attentions that can be prescribed in a planning phase at the scale of a watershed. These analyses give an overview but do not provide information on the influence of smaller landscape characteristics and topographical shapes such as street patterns and orientation, slope length and gradient, roughness of the soil, type and range of vegetation, building characteristics as well as the organization and capacity of the sewer system. Some of these landscape features such as street patterns or slope characteristics are already available on platforms (provided BRIC) [CIRB-CIBG, 2014b]. Other data, such as building characteristics, type and range of vegetation, organization and capacity of the sewer system are often accessible in one Region and not in another. On-site observations can also provide information for relatively small scale projects. Nevertheless regardless of the project scale all these data are essential to analyze the dynamics of runoff flows and achieve IWM. 28This article discusses the wide range of available cartographic data of the areas within and around the Brussels Capital Region and their possible applications for an integrated water management in urban planning. The cartographic data is characterized by a high variability in terms of units and resolution and by the differences in regions or geographical areas covered. Data search and handling are complex and time demanding, in particular because of non-concordance between supposedly analogous data in the two Regions, developed using different procedures and without sharing at least a common terminology. 29The analysis of the BCR and its surroundings revealed the particularities of the different topographical watersheds in terms of land use and of its influence on the urban water cycle. As each land use can be associated with specific water management strategies, this description provides guidance to orient solutions for water related problems. The Molenbeek watershed and its surroundings are used as example and analyzed more thoroughly. The analysis identified the zones where infiltration and resurgence of groundwater occur and underlined the importance of these zones for the water quality of the Molenbeek. Furthermore, the Molenbeek watershed is divided into several different zones characterized by their dominant land use. The latter makes it possible to suggest the most appropriate measures for the IWM within each zone of the Molenbeek watershed. 30We considered examples from two scales -large to medium- relevant for urban planning. The different analyses and their outcomes constitute the fundamental bases for the development of IWM, and are useful examples for urban planning. We identified two main deficiencies of the currently available cartographic data, non-concordance and non-accessibility of data. These deficiencies are limits to the development of effective IWM solutions and other transboundary planning activities. A geographical database covering all the regions, offering data sharing common technical characteristics would make these data more available, easier to use and allow more transparency and control over its quality. The institutions in charge of these data, to seek a more efficient use of their resources, should thus work towards a more coherent and accessible framework for cartographic data, a starting point for a more efficient urban planning in Brussels. BACKHAUS, Antje, DAM, Torben, & JENSEN, Marina Bergen, 2012. Stormwater management challenges as revealed through a design experiment with professional landscape architects. In: Urban Water Journal, 2012, Vol. 9, No. 1, p. 29‑43. BRUSSELS CAPITAL REGION, 2008. Plan Régional de lutte contre les inondations : Plan PLUIE. 36 p.
DIETZ, Michael E., 2007. Low impact development practices: A review of current research and recommendations for future directions. In: Water, air, and soil pollution, 2007, vol. 186, No. 1‑4, p. 351‑363. LAGA, Pieter, LOUWYE, Stephen & GEETS, Stéphanie, 2001. Paleogene and Neogene lithostratigraphic units (Belgium). In: Geologica Belgica, 2001, 4/1‑2; p. 135‑152. PETRUCCI, Guido, RIOUST, Emilie, DEROUBAIX, José-Frédéric & TASSIN, Bruno, 2013. Do stormwater source control policies deliver the right hydrologic outcomes? In: Journal of Hydrology, 2013, Vol. 485, p. 188‑200. SCHNEPF, Max, COX, C., 2006. Environmental benefits of conservation on cropland: the status of our knowledge. Soil and Water Conservation Society, 2006. 326 p.
SOREL, Aurelie, DE BONDT, Kevin and CLAEYS, Philippe, 2011. Re-naturalization of an urbanized valley through the reconnexion of open streams: Case of the Molenbeek River in Brussels, poster presented at ScaldWIN Interim Seminar, 19th May 2011, Antwerp, Belgium. Tom Goosse has a master degree in physical geography from the Vrije Universiteit Brussel (2012). His Master thesis was part of an international research program focusing on rainfall management in the Tigray province of Ethiopia. His personal interests being more oriented towards the rainfall problematic in Brussels, he is now working towards a PhD on the application of water Low Impact Development techniques in urban settings. Kevin De Bondt has a master degree in Geology from the Université Libre de Bruxelles (2005) and a specialization in Natural Hazard management from the Université de Liège. Since March 2008, he carried out many projects in the Brussels Region and abroad, on the urban water cycle, flood-mitigation in urban environments, river restoration and rainwater infiltration. He has developed the concept of Urban Hydrological Landscapes that summarizes the heterogeneity of the physical environment and make its integration in urban planning measures possible at local and regional scale. He frequently consults or advices public authorities and citizen groups on water policies. Dr. Guido Petrucci is an environmental engineer and urban hydrologist working on storm-water management in urban areas. After a joint degree in engineering (Politecnico di Milano and Ecole Centrale Paris), he obtained in 2012 a PhD in Urban Planning at Université Paris-Est. In his thesis, he carried out an interdisciplinary study of the current regulatory practices of decentralized storm-water management, by crossing public policy analysis with hydrological modeling of urban catchments. This work resulted in publications in international scientific journals and in a broad interest by local authorities of the Paris region. He also collaborated to several projects on urban runoff pollution and on the calibration of hydrological models. Dr. Philippe Claeys is a geologist, planetary scientist and geochemist interested in documenting global changes and in particular the consequences of asteroid and comet impacts on the evolution of the biogeosphere. Since 2001, he is a professor at the Vrije Universiteit Brussel, where he now heads the research unit Analytical-, Environmental-, and Geochemistry. He also established the interdisciplinary research unit Earth System Sciences. He is a visiting professor at Universiteit Gent, the Katholieke Universiteit Leuven and the Université de Liège. He works with PhD students and postdocs on a wide variety of projects ranging from Antarctic meteorites, to paleoenvironmental changes, geoarcheology or urban water management.